Jordan Todosey at the 23rd Annual GLAAD Media Awards in California. Jordan Todosey and Annie Clark at the 23rd Annual GLAAD Media Awards in California. 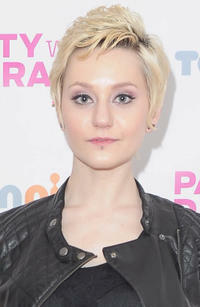 Jordan Todosey at the premiere of "Party With Degrassi" in New Jersey. Linda Schuyler and Jordan Todosey at the 70th Annual Peabody Awards in New York. Jordan Todosey and Alex Steele at the premiere of "Party With Degrassi" in New Jersey. Jordan Todosey at the 70th Annual Peabody Awards in New York. Jordan Todosey, Linda Schuyler and Annie Clark at the 23rd Annual GLAAD Media Awards in California. Melinda Shankar and Jordan Todosey at the premiere of "Party With Degrassi" in New Jersey.